It was easy to think that I had made it up. My memory said that the series on the fledgling Fox network once featured an episode in which Officer Doug Penhall (the incomparable Peter DeLuise) travels to El Salvador to locate his missing wife (in my recollections, however, it was not El Salvador – I’m pretty sure I didn’t even know that El Salvador existed at the time – I just had a vision of Penhall going to some Spanish-speaking place, or, perhaps, due to the outbreak of the first Gulf War during that time, the Middle East somewhere). And I recalled that the emotional climax was set to “Without or Without You,” a song that I hadn’t put in context yet, by a band I wouldn’t really be aware of until they had a pretty popular video from the Batman Forever soundtrack. But that couldn’t have actually happened right? This the show in which Johnny Depp goes undercover as a high school student to break up an amateur weed-dealing ring, in which Peter DeLuise was still somehow eligible for the varsity football team, in which Holly Robinson-Peete cornered the market on denim. So there couldn’t have been an episode in which Penhall and Hanson get embroiled in a Latin American revolution, right? With machine guns and rebel armies and jungles and explosions? Nah. In which Penhall grieves over his dead wife at her makeshift grave? No. No way. Now an episode in which Hanson is afraid to share chocolate milk with an HIV-positive student? Sure. Richard Greico’s Booker getting super high and then absolutely dominating on the schoolyard basketball court? I’ll buy that. But not an epic, emotional, tragic trek through a Latin American nation in turmoil set against the most moving and gut-wrenching song from the Irish Beatles (before the pomposity and pretentiousness of later fare like “Beautiful Day”). We think not. But it was real! Sure, if you look up that episode now – “La Bizca” (translation: “the cross-eyed”) – and watch on Hulu, or view it on your complete series DVDs (which I know you have), the song has been replaced with some generic stock music. To be fair, it’s amazing that they were able to use it for the original broadcast in the first place, so it would be greedy to expect to fire up your Amazon Prime and still hear the strains of The Edge’s guitar. But, thanks to some intrepid, heroic YouTube users, the original version exists (taken from what we think was a German broadcast, naturally), and it can be seen in its original glory, the way that Bono never intended because he probably didn’t know that 21 Jump Street was a thing. And when we say “its original glory” we also mean before “With or Without You” was usurped and recontextualized by Friends when Ross and Rachel couldn’t agree on the terms of a “break.” Years after “La Bizca” we remember watching Rachel stare out her fake window in her fake NYC apartment as fake snow fell down and we were immediately bothered by this song being appropriated as the soundtrack to their not-really-star-crossed romance. These two selfish, self-obsessed, entitled yuppies let a little fight and a copy shop girl get between them, and they have the audacity to proclaim this as their theme song, the anthem to their dysfunctional, overwrought, will-they-or-won’t-they romance? That, we recall then and recall now, was very upsetting. 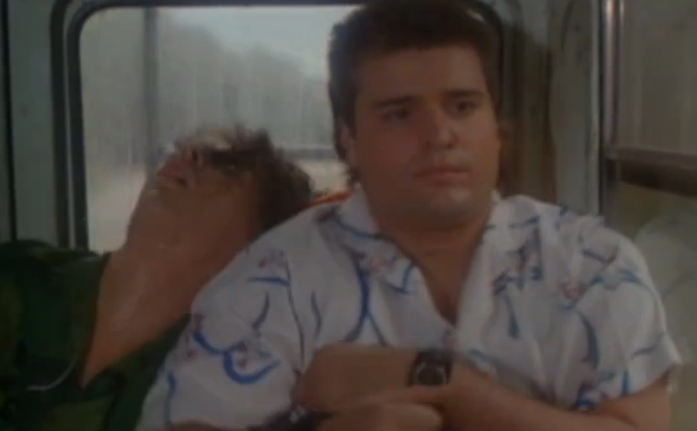 The emotional depths of “With or Without You” should be reserved for a Doug Penhall traveling halfway across the world only to learn that his wife has perished in the midst of a brutal civil war, not for a fashion buyer and a whiny guy with a monkey who break up after every petty squabble. It’s an insult to “With or Without You,” and its an insult to the late Marta Penhall. Would you use Leonard Cohen’s “Hallelujah” to accompany Phoebe giving birth to her brother’s triplets? No, you wouldn’t. And this was arguably worse. And when we say “its original glory” we also mean the manner in which “With or Without You” was used in the television series versus how it might be used in the movies; which is to say without any trace of irony, but instead just dripping with earnestness. The polar opposite of 21 Jump Street the movie (and its sequel), 21 Jump Street the show was hyper self-serious. Sure, you don’t have a series with Peter DeLuise at the forefront and not have your fair share of yuks, but the show did not allow for any degree of winking or self-parody, any even vague allusion to its absurdity. Racism in high schools and a Vietnamese extortion ring and a clown kidnapping his grandson and revolutions in El Salvador, this was never played for laughs, but for very special episodes at best, didactic social commentary at worst. But good or bad, the original 21 Jump Street was committed to the integrity of these stories, and that probably goes a long way towards explaining why Johnny Depp was so eager to flee the Jump Street chapel. It wasn’t the best show – not by a long shot – and it didn’t always do a great job of tackling the big issues – again, not by a long shot – but you can’t say they didn’t aim high. And if their aim wasn’t true – and it usually wasn’t – their intentions were. Much like, you might argue, a little rock band out of Dublin.